If ever an example of Sun columnists doing as they are bloody well told were needed, the perpetually thirsty Paul Staines and his rabble at the Guido Fawkes blog appear to have provided it, as one of their number has laid bare a gap in their coverage of events which is not otherwise easy to explain away. The subject, one which the Fawkes folks have previously been so ready to exploit, is the saga of the Danczuks. 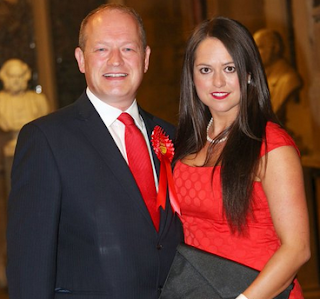 As Zelo Street has previously told (see HERE and HERE), nominally Labour MP Simon Danczuk took a brief timeout from bandwagon-jumping last weekend to let the world know that he and wife Karen were separating. Exactly where that left her, with much of her income coming from working for him, and mounting debts from the former Deli in Rochdale town centre, is not at present known. Alas, it did not take long for the tearful separation to turn to recrimination, as he took to Twitter to swipe at her. And it was clear that it was Karen who had a direct line to Rupe’s downmarket troops at the Super Soaraway Currant Bun. But, while all this was going on, the Fawkes blog was silent. 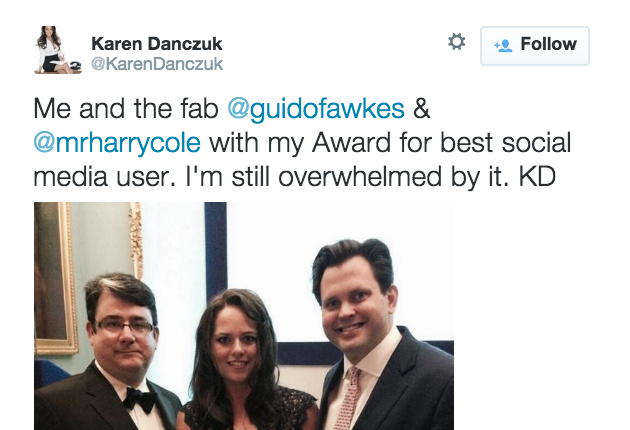 What a change from splashing Ms Danczuk all over their pages and manufacturing a suitable excuse to give her an award. Yes, Ms Danczuk believes that Staines and his tame gofer, the odious flannelled fool Henry Cole, are “fab”, rather than a pair of Grade A sleazebags you would not trust any further than you could chuck either of them. So why no comment on the latest happenings chez Danczuk? It could always be explained away by claiming that the Fawkes rabble was merely prioritising, that there were more important fish to fry. But then came a most interesting development: the Spectator’s Steerpike column, most of which is the work of Master Cole, has run an item titled “Simon Danczuk lashes out at Karen Danczuk following split”, telling “Over the weekend, Simon Danczuk confirmed his break up from his wife Karen Danczuk, with both the Labour MP and the ‘Selfie Queen’ describing themselves as devastated at the decision”. And there’s more. “Alas, any sadness appears to have turned into anger. Simon has taken to Twitter to accuse Karen of using their split for publicity. He says that she is helping her personal trainer ‘friend’ to promote his gym … Whatever could he mean?” Whatever indeed. In the absence of information to the contrary, one must assume that Cole was the author. He’s still at the Fawkes blog - until joining the Sun next month. So why isn’t the Fawkes blog running the story? Ah well. The Fawkes rabble - as opposed to Cole when he’s doing stuff for the Speccy - are Murdoch columnists, having a regular berth in the Sun on Sunday. No mention of Ms Danczuk on their blog, with her being a Sun exclusive property? As Private Eye magazine might have put it, “I wonder if the two are in any way related? I think we should be told”. Has The Great Guido been leant on by his new masters? Speak up, Fawkes people.